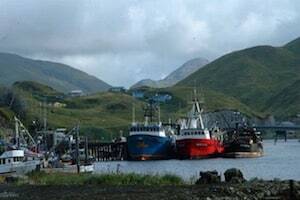 For more than 20 years, Dutch Harbor, Alaska has been the highest grossing commercial fishing port in the United States. It is home to many factory trawlers, fishing tenders, crab boats, long-liners, and other vessels catching fish or transporting fish in the Bering Sea and the Gulf of Alaska. Many of these companies are based elsewhere like Seattle, Washington or may be based in Dutch Harbor. Seafood companies with operations in Dutch Harbor include Alyeska Seafoods, Unisea, Inc., Westward Seafoods, Clipper Seafoods, Icicle Seafoods, American Seafoods, Trident Seafoods, United States Seafoods, and many others. Injury Compensation is Different on Fishing Vessels. Before going up to Dutch Harbor to fish on a factory trawler or other commercial fishing vessel, it is important to understand what happens if you get injured while working on-the-job. Unlike injuries that occur on land, injuries that occur on commercial fishing vessels or other boats are covered under the federal Jones Act and general maritime law. These systems pre-date state-based workers’ compensation systems. Common injuries on commercial fishing vessels include slips and falls, lifting injuries, crush injuries to hands and feet, injuries from being struck by heavy objects, falling overboard, and many others. Benefits Available under Jones Act. Fish processors, deckhands, mates, engineers, and other commercial fishermen or workers injured on fishing vessels generally have access to better benefits that workers injured on land. However, these workers must establish that their injury was caused by an unsafe condition or act before they will be entitled to benefits under the Jones Act and/or general maritime law. Under the Jones Act, you may be entitled to lost wages for the entire time that you’re off work due to the injury. If you cannot return to work in your job of injury, you may be entitled to benefits to help you re-train to do another job that is more suitable with your post-injury physical condition. You may also be entitled to payment for future lost wages if your injury impairs your ability to earn a living. Further, the Jones Act and general maritime law allow an injured commercial fishermen to collect damages for pain, disability, and loss of enjoyment of life caused by your injury. There is no set formula to determine the appropriate value of compensation for pain, suffering, and disability. Only an experienced maritime injury lawyer can offer an opinion regarding the value of your personal injury case. Do not accept a quick settlement from the fishing company without first consulting with a qualified maritime injury attorney. Factors that may be considered in determining compensation may include: the nature of the injury; how much pain the injury causes; how the injury impacts your ability to function in daily living; how long the injury lasts; the overall impacts on your ability to enjoy other activities of daily living; and what juries and judges have awarded in similar cases. Consult with Experienced Maritime Injury Lawyers. Our lawyers have represented injured commercial fishermen for decades and have the experience necessary to obtain full and fair compensation for your injury whether it occurred in Dutch Harbor, out on the Bering Sea, or in the Gulf of Alaska. We offer a free consultation and will meet with you where it is convenient for you. Contact us today for a free case evaluation at 206.624.8844.